Boasting stunning rooms with sumptuous decor and luxury bathrobes, Velvet Hotel is located on central Manchester’s Canal Street. Its chic and stylish bar features a fish tank in the stairs. 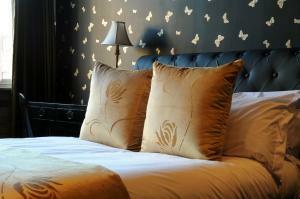 Furnished with luxury and elegance, all rooms offer an iPod dock, along with a large TV/DVD player and free Wi-Fi. Stylish, modern bathrooms provide slippers, steam-free mirrors and luxury toiletries. Each room also includes a fully-stocked minibar and hospitality tray. Velvet Lounge Bar has live DJs on weekends, and offers drinks in its fashionable, relaxed surroundings. In Manchester’s bustling centre, Velvet Hotel is located within a 10-minute walk of central Manchester’s vibrant restaurants and nightlife. The Arndale Centre and Oxford Road Rail Station are just 10 minutes’ walk away. The cancellation deadline is 15:00 (see the 'Cancellation' section for day). Guests booking Party Packages may experience noise at night due to loud music played at the bar.